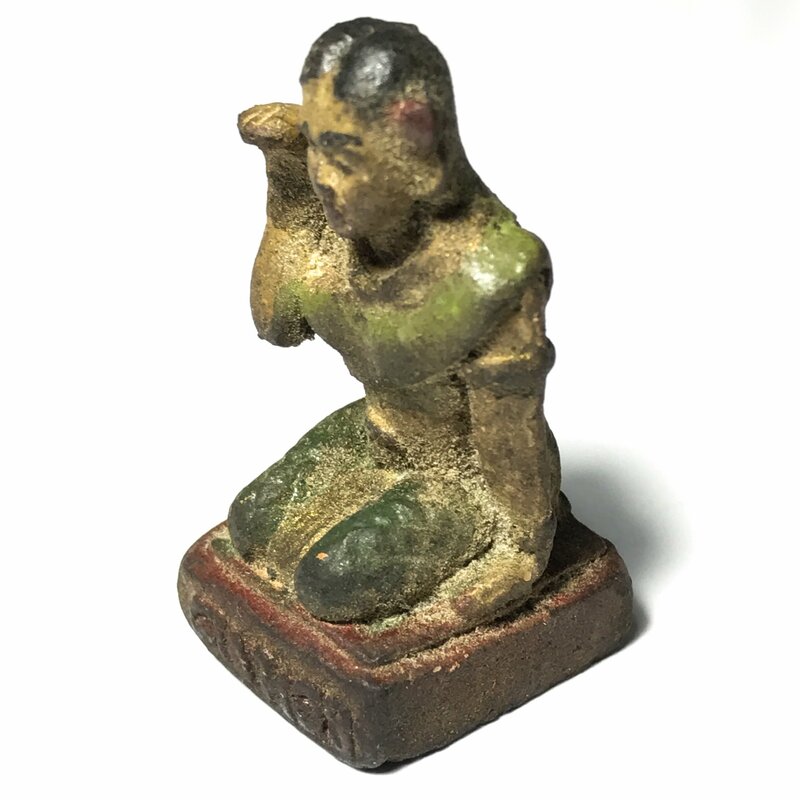 A very rare antique Sacred Pra Nang Kwak Supawadee Merchant's Daughter Loi Ongk Statuette from the Great Olden Days Master of Kumarn Tong, Pla Tapian and Wicha Nang Kwak, Luang Por Te Kong Tong, deceased abbot of Wat Sam Ngam. The statuette is usable as a mini Bucja statue for altar placement, on the cash till in your place of business, or even for wearing as a portable amulet. This antique Nang Kwak statuette is typically fashioned in Luang Por Te's Ubiquitous style, with painted colours, and roughly hewn features as was the way in olden days. The Sacred Muan Sarn Clay is made from Sacred Powders and Earths, and Prai oils for which Luang Por Te was so famous, rich in powerful magickal ingredients. The base of the statue has the words 'Kong Tong' embossed, which is a common signature seen on amulets and statues of Luang Por Te..
Luang Por Te was a Great Sorceror Monk of the Second World War Era who had learned powerful Wicha Kumarn Tong from Khmer Sorcerors of the Lay Tradition, and was the direct Wicha inheritance Master apprenticeship holder of Luang Por Ta, of Wat Paniang Dtaek, and Luang Por Chaem, of Wat Ta Gong. He was present on many of the Greatest Blessing Ceremonies of amulets in Great templs around the country, almost always invited for his Powerful Wicha. He was regarded as the world's number one top master of his day for Wicha Kumarn Tong. Robberies and Burglaries reduced to an almost unnoticeable level. But Luang Por Te did not only empower the Kumarn Tong for Protection; The powerful Metta Mahaniyom Maha Sanaeh Maha Lap Magic of the Kumarn Tong also brought the municipality and indeed the province of Nakorn Pathom to increasing prosperity as the local traders and market sellers experienced incredible increase in profits, customers, and even lucky fortuenes with lottery. Thus it began, that the legend of the Kumarn Tong Luang Por Te was begun. Although Luang Por Te was and continues to remain world famous for his powerful wicha Kumarn Tong, Luang Por also made a vast array of other amulets, almost all of which are popular and considered very powerful by the devotees of this Legendary Master. He made many types of Takrut (especially famed for the Tiger Forehead Takrut), See Pheung and Nam Man Prai, Sacred Powder amulets, metal coins, occult charms, Pha Yant (Yantra Cloths), and varuious kinds of Bucha statues. His power of Kong Grapan Chadtri, Klaew Klaad, Maha Lap, Kaa Khaay, Maha Pokaap and Maha Amnaj, also enjoys legendary status and world wide fame.